Cuisinart 5.5-Quart Saute Pan Just $46.99! Down From $150! PLUS FREE Shipping! You are here: Home / Great Deals / Amazon Deals / Cuisinart 5.5-Quart Saute Pan Just $46.99! Down From $150! PLUS FREE Shipping! Don’t miss this amazing deal from Amazon! Grab this Cuisinart 5.5-Quart Saute Pan for only $46.99, down from $150.00, PLUS FREE shipping! 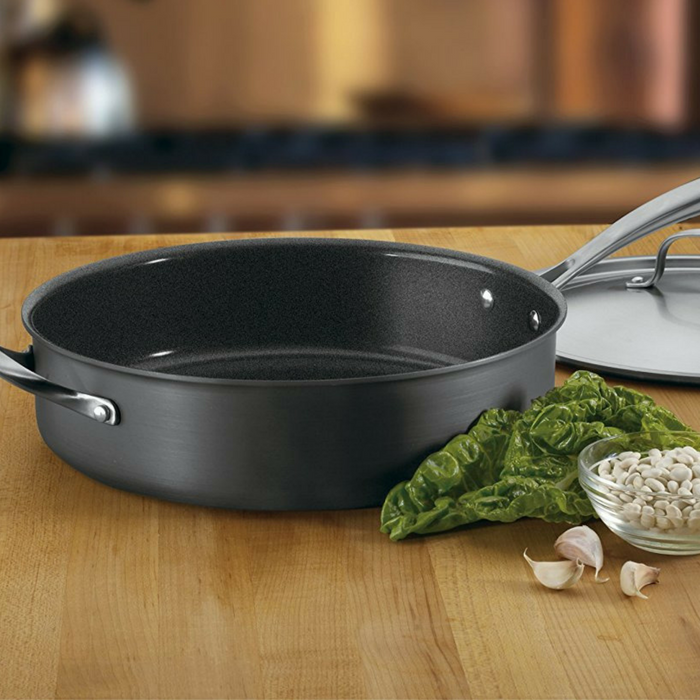 The Cuisinart 5.5-Quart Saute Pan is designed with an exclusive Cuisinart Ceramica nonstick surface, which features a petroleum-free, ceramic-based coating that is applied at a temperature one half that of traditional nonstick. The coating does not contain PTFE and PFOA, substances often used in nonstick cookware that have raised health concerns over the years! The pans deliver superior heat conductivity, requiring less energy to achieve the desired cooking temperature. Harder than stainless steel, this pan’s hard-anodized exterior is dense, nonporous, and highly wear-resistant for extra durability and professional performance as well as quick and even heat distribution. Additionally, the securely riveted stay-cool steel handles are manufactured using 70 percent recycled stainless steel and is oven-safe to 500 degrees F, so food can be browned on the stovetop then transferred to the oven to finish cooking. Healthy Cooking, Easy Cleaning: You do not need to add oil or butter to prevent foods from sticking. If you wish to enhance the flavor and appearance of foods, you need add only a minimum amount to the nonstick surface of your cookware. Convenient Storage: Has a smooth exterior finish, making it easier to clean and maintain. Food residue or buildup on the exterior of your cookware can easily be removed with hot soapy water and a scrub pad.